September 22, 1863. “Born in 1832 in Oswego, New York, Mary Edwards Walker graduated from Syracuse Medical College. 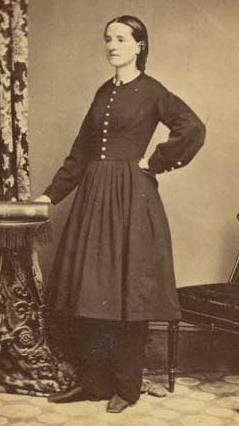 When war broke out, she served initially as a nurse, but in September 1863, over the strong objections of male doctors, Walker was appointed assistant surgeon of the Fifty-Second Ohio Infantry Regiment, the first woman to be appointed to such a position. Walker was known for looking after the wounded of both sides. She was captured by Confederate forces on April 10, 1864 after she had stopped to treat a wounded Confederate soldier, and she spent four months in a Confederate prison camp. After the war, Walker wrote and lectured on behalf of temperance, women’s rights, health care, and dress reform; she wore men”s clothing and was arrested several times for impersonating a man. Shortly after the end of the war, she became the first woman to be awarded the Medal of Honor, but in 1919, the Board of Medals revoked her award and that of 910 other individuals. The eighty-seven-year old physician said, “You can have it over my dead body.” (The medals did not have to be returned; the 911 names were simply deleted from the official list of recipients.) She died six days later, a year before the Nineteenth Amendment to the Constitution guaranteed women the right to vote. She was buried in her black suit rather than a dress; an American flag was draped over her casket. Note: Walker’s Medal of Honor was restored to her posthumously in 1977. Phillips and A. Axelrod, My Brother’s Face, p. 112.